Water is indispensable to any kind of terrestrial life. It spreads a 3/4 of our planet's surface. The water is present in the atmosphere as well as in the terrestrial magma. The three existing forms of the water on our planet are : solid ( ice, snow, hail), liquid (seas, oceans, lakes, rivers, clouds) or gas ( water vapour). The total reserve of water in the earth system is of 1 342 409 250 km3 . The 97% of the water present on our planet is salt water which is found in the oceans ; the remaining 3% is fresh water. The fresh water is distributed in glaciers ( 77,2%), the soil or groundwater ( 22,5% ) , lakes and rivers ( 0,3) and atmosphere (0,03%) . The amount of precipitation on the ocean is estimated to an average year of 870 mm whereas the evaporation is 970 mm and over the continents the average year precipitation is 670 mm for 420 mm of evaporation and 250 mm of runoff. A part of the water coming from the precipitations returns to the atmosphere by evapotranspiration. This designates the quantity of water transferred from the soil to the atmosphere by evaporation and plant transpiration. The evapotranspiration is depending on a big number of parameters as the temperature, wind, humidity, radiation, etc. slow underground flow, following the infiltration process ; this water is often stored in the groundwater reservoirs ( aquifers ) constituted by the porous water-bearing formation ( bed or stratum ) of permeable rock, sand or gravel capable of yielding significant quantities of water . Finally, the surface and ground water runs to the seas , if it was not used by man. 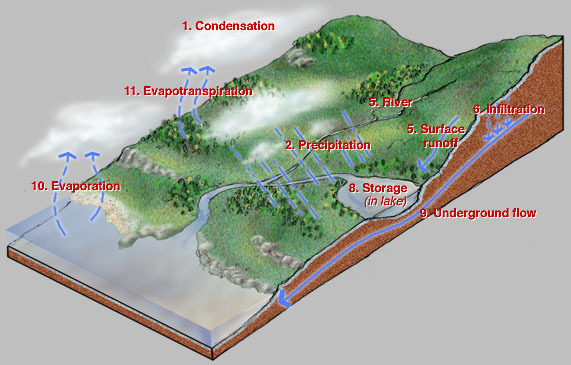 The water cycle pursuits : the water bodies and lands are humidifying the mass of the air transported by wind through the evaporation and evapotranspiration. The condensation forms the clouds and these pass again to precipitations on the continents, islands and, of course, on the oceans. To establish the water balance for an area and a given time period means to suppose that we are able to asses both the input and the output water volumes in the different drainage basins composing the concerned area . The drainage basin ( catchment area, watershed ) of a river is the surface area where the precipitation is drained by the river . The outlet of a drainage basin is the opening through which the water arising from him flows out . The stay of the water in different forms of the hydrological cycle is very inconstant. The mean water stay in the atmosphere is of about one week , of several days in the streams or rivers, of about thirty centuries in the oceans and from centuries to the millenaries in the bigs aquifers .